Many Christians are uncomfortable with the idea of God’s judgement and punishment of sin. But as we enter the period of Advent, these themes are inescapable. For how can we celebrate the birth of a Saviour, unless we ourselves are in a real danger from which he will save us? Jesus himself was the one who preached most clearly and vividly on the reality and horror of the judgement that would come upon all those who refuse him and continue in rebellion against their Creator. But Christian artists are also in difficulty knowing how they might represent the reality of that judgement. On the one hand, there is the danger of appearing self-righteous and smug, inevitably seeming to side with the justified, and looking down on the plight of the lost. Michelangelo, with his customary genius, avoided this problem in his Last Judgement in the Sistine Chapel by painting his self-portrait onto the limp, flayed skin of St Bartholomew – saved at the last, but by no motive power of his own, only by the power and grace of Christ. On the other hand, artists depicting judgement can so easily fall into the shallow thrills of the disaster movie, glorying in apocalyptic destruction. 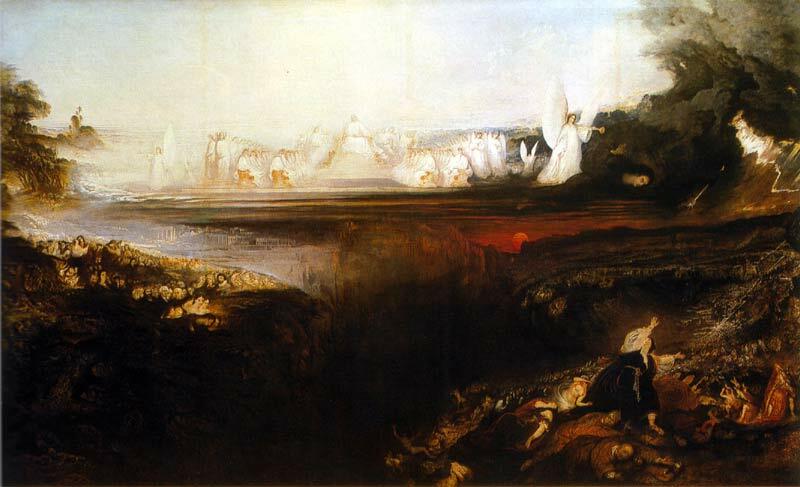 John Martin (1789-1854) doesn’t entirely escape either danger. All his career he had specialised in large-scale scenes of judgement and disaster, and despite or perhaps because of his immense popularity and financial success, he had been vilified by the upper-class critics for populism and showmanship. 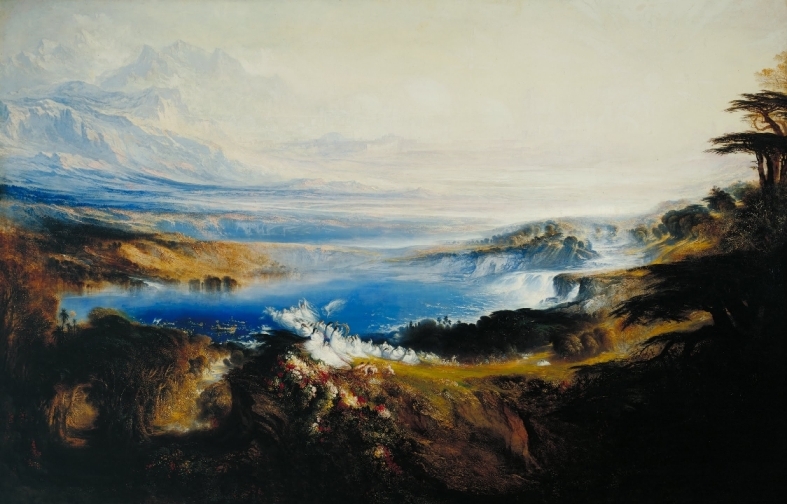 John Ruskin dismissed him as not an artist but a manufacturer, producing images with machine-like regularity and absence of feeling or conviction. In our own century, as the current exhibition at Tate Britain points out, several makers of disaster movies revisited Martin’s images to borrow specific compositions (e.g. D.W. Griffiths' silent film Intolerance (1916), Ray Harryhausen's Clash of the Titans (1981), Towering inferno, The Day after Tomorrow and 2012). In his last great work, a triptych depicting the Last Judgement, the destruction of the world, and the recreated new heavens and new earth, there is certainly a monumental scale to his endeavour. In The Last Judgement there is also more than a hint of self-justification as Martin places a number of recognisable figures among ‘the just’ on the left-hand side, including, as was observed at the time, a disproportionate number of artists! He also, coming from a strongly evangelical background, conspicuously places among the damned a Roman Catholic priest, falling headlong beside the Whore of Babylon. Compared to the rest of his family, however, Martin was fairly easy going in his convictions. His brother Jonathan was imprisoned after trying to set fire to York Minster because he did not feel that God was properly worshipped there. Nevertheless, for those approaching this triptych with the eyes of faith, there are some strong, redeeming features. 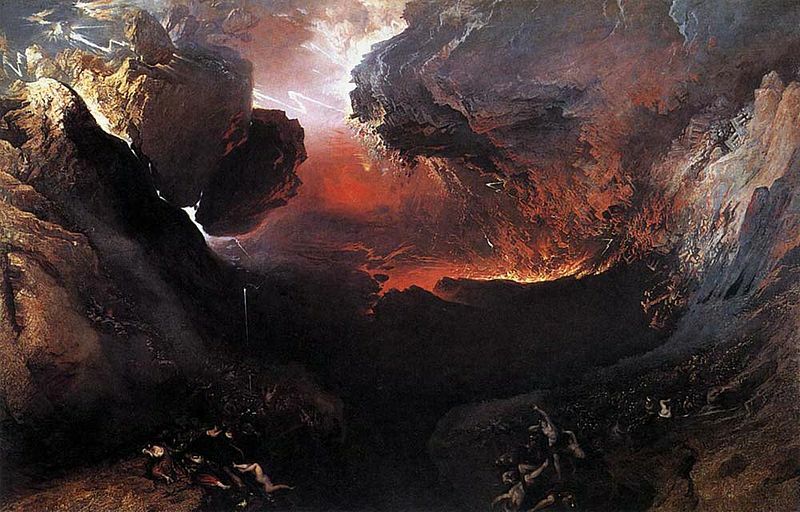 In the current exhibition you can stand in front of the The Great Day of His Wrath with the image at eye-level: normally the Tate hangs it high up at the top of a wall. Now you can feel the world literally turning upside down, and you see the true inky blackness into which all the fallenness of the sinful world will be destroyed. Hard as it is to imagine, ‘the day of the Lord will come like a thief. The heavens will disappear with a roar; the elements will be destroyed by fire, and the earth and everything in it will be laid bare’ (2 Peter 3:10). Then looking at The Last Judgement I was struck by Martin’s decision to show specific individuals as well as to suggest numberless crowds in the distance. Disaster movies tend to focus on the scale of disaster, with the victims being unnamed, featureless crowds, caught up in meaningless and purposeless cataclysm. Martin’s paintings, however, do point up that the final destruction of all things will not be meaningless or purposeless. It will be the deliberate act of judgement by our Creator. And human beings will not be lost as a featureless crowd, but God will call each of us to account for our lives and, in particular, for how we have responded to his Son. Finally The Plains of Heaven re-imagines our eternal lives as indwelling this world renewed. No Platonic vision of disembodied spirits escaping from the material realm. In Martin’s picture there is the celestial city in the distance; and in the foreground the delights of human community, set among the renewed creation of woodland and flower-strewn meadows. Advent is not just for looking forward to Christmas. It also reminds us that we await the second coming of Jesus and the renewing of all things. Martin’s painting does offer us an extremely attractive vision of the future, of an inheritance that is worth waiting for as we eagerly expect the return of the Lord Jesus.